The WSGA annually conducts tournaments and championships for players of various ability levels. The Wisconsin State Golf Association was initially formed back in 1901 in order to determine the best golfer in the state. So, the first State Amateur Championship was born and forty-two players journeyed to Sinnissippi Country Club (now Janesville Country Club) to see who would triumph. Hamilton Vose of Milwaukee Country Club came and won the championship and, rightfully so, since he was also the first WSGA President. Presently, the WSGA annually conducts fourteen state championships, twelve Net Partners tournaments, twenty Senior Tour events and, in conjunction with the WPGA, hosts the Nelthorpe Cup matches; a competition between the best amateurs and professionals in the state. The WSGA also conducts the regional qualifying in the state of Wisconsin for eight of the United States Golf Association Championships – The U.S. Open, U.S. Senior Open, U.S. Junior (Boys) Amateur, U.S. Amateur, U.S. Senior Amateur, U.S. Mid-Amateur, U.S. Amateur Four-Ball, and U.S. Women's Amateur Public Links. A brief description of each WSGA-sponsored tournament, along with important eligibility requirements, is listed below. Should you have any further questions, feel free to call our office (414) 443-3560 or email info@wsga.org. This event has been conducted annually since 1901. The format, originally match play, was changed to a 72-hole stroke-play event in 1971. The State Amateur, contested over four consecutive days, is annually conducted on one of Wisconsin’s finest courses and continues to be recognized as the premier amateur tournament held in Wisconsin. A three-man team competition, the Yule Cup, where players representing the same club compete for the Cup, is also held. To be eligible, players must have a WSGA Handicap Index of 9.4 or less. When the State Amateur was changed to stroke play in 1971, there was a need for the addition of a State Match Play Championship. The WSGA returned this event to the tournament schedule in 1975. This growing event has been expanded to allow 64 qualifiers to enter into match-play competition following an 18-hole stroke-play qualifying. Five 18-hole pre-qualifying tournaments are held in May and June for all those players who are not exempt. Exemptions were given to those players with 50 or more points on the WSGA Amateur Player of the Year point list. To be eligible, players must have a WSGA Handicap Index of 9.4 or less. This two-man, bestball (four-ball) scratch tournament format starts with 36-hole stroke play qualifying at two different 18-hole golf courses before the low 32 teams enter into match-play in order to determine the champion. Team members do not have to be from the same WSGA member club. To be eligible, teams must have a combined WSGA Handicap Index of 12.0 or less. In 2014, the Director's Cup Championship and Governor's Cup Championship were combined into the Mid-Amateur Championship. This statewide 36-hole tournament is conducted for players age 25 and older. The championship trophy is awarded to the player with the lowest 36-hole gross score. Additionally, players compete in two age divisions, representing the formats of the former Director's Cup and Governor's Cup Championships. Players age 25-39 will compete in a Director's Cup division and players age 40-54 will compete in a Governor's Cup division. Prizes are also awarded in both gross and net divisions. To be eligible, players must have a WSGA Handicap Index of 11.4 or less. This statewide 36-hole tournament, conducted for players aged 55 and older, was started in 1981 and is considered the finest senior event in the state. Competition for both gross and net awards is conducted in three different age divisions: Senior (55-64), Super-Senior (65-69) and Legends (70 & over), as well as for the overall gross and net trophies. A three-man team competition, the Sam Ruskin Cup, where players representing the same club compete for the Cup, is also held. To be eligible, players must have a WSGA Handicap Index of 16.4 or less. The WSGA added a new tournament to its schedule in 2002 for senior men age 55 and over. An 18-hole stroke-play round is played on Monday morning to determine the 32 players who will make up the match play field. First round matches take place on Monday afternoon. Second round and quarter-final matches take place on Tuesday. The semi-finals will be played on Wednesday morning followed by the championship match in the afternoon. A Super-Senior age division was added for players age 65 or older. The Super-Senior age division qualifies 16 players into match play. To be eligible, players must have a WSGA Handicap Index of 12.4 or less. This Senior Bestball (Four-Ball) Championship, started in 1986, is conducted in a stroke play format over 36 holes. Two-man teams compete for gross and net awards. Team members do not have to be from the same WSGA member club. 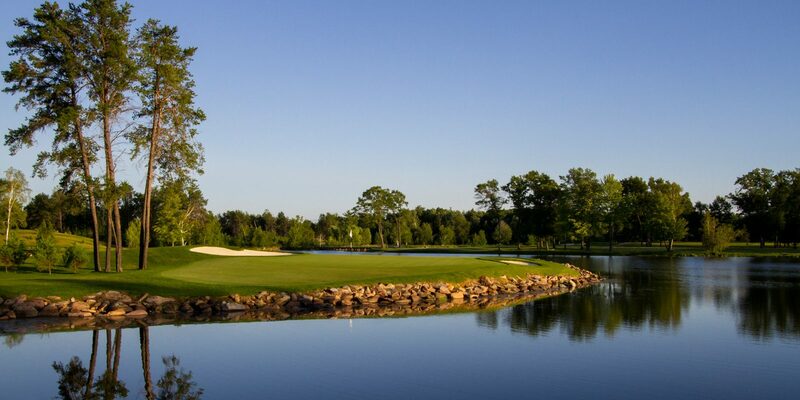 The Senior Bestball (Four-Ball) Championship is annually conducted on one of Wisconsin’s finest courses. To be eligible, teams must have a combined WSGA Handicap Index of 22.4 or less. This tournament is open to all boys who have not and will not attain their 19th birthday during the championship. The event is conducted under a stroke play format over 54 holes and features three divisions: 14 and under, 15-16, and 17-18, in addition to the crowning of an overall champion. A team competition also takes place during the tournament, where three-man teams representing the same club compete to take home the trophies. The aggregate score of the three-man team over the first 36 holes determines the team champions. To be eligible, players must have a WSGA Handicap Index of 15.4 or less. Started in 1911, the father and son event has grown to become one of the most popular WSGA championships. The tournament features an alternate shot format with one team member driving off of all the even-numbered holes and the other team member driving off of all the odd-numbered holes. The top teams in both gross and net divisions are awarded prizes. Because of the popularity of the tournament, a second site was added in 1996 to accommodate all who entered. To be eligible, each player must have a WSGA Handicap Index not exceeding 36.4. The maximum Handicap Index allowed for any contestant is 36.4. In 1995, the WSGA added to its schedule a series of net tournaments designed to give players of all abilities a chance to compete in a tournament format. The resulting Net Partners tournaments, where two-person teams compete in an 18-hole event, have proven to be quite popular. It is a combination event in which the net score for each player is added together with their net bestball score. The top five teams from each of ten Net Partners tournaments are invited to compete in the season-ending Net Partners Championship, where the overall champions are crowned. To be eligible for the Net Partners Tournaments and Championship, players must have a WSGA Handicap Index. The maximum Handicap Index allowed for each contestant participating in the competition is 36.4 for men and 40.4 for women. In 2010, the WSGA added the Senior Tour for players 55 and older. The first year featured ten qualifying events, held at eight sites, all played under the stableford scoring system. The Senior Tour now features eighteen separate qualifying events. Prizes are awarded for top gross and net finishes in both a Senior and Super-Senior age division. Top finishers also earn Senior Tour Player of the Year points. Players with the most points at the end of the season earn a invitation to play in the Senior Tour Championship at Wild Rock Golf Club in Wisconsin Dells. New in 2014, players receiving an invitation to the Senior Tour Championship also receive a complementary entry into the Championship tournament. The maximum Handicap Index allowed for each event is 25.4. The WSGA 2-Man Team Championship is one of the WSGA's newest state championships. This two-man team event is played over three rounds, with each round using a different format. The first round is played under the four-ball (bestball) format, the second round is foursomes (alternate shot), and the third round is a scramble, thereby yielding a 54-hole team score. Team members need not be from the same club. All competition will be played at scratch - no handicaps. To be eligible, team members must have a combined WSGA Handicap Index of 12.0 or less. In 2013, the WSGA added a senior version of the 2-Man Team Championship. The senior event is open to players 55 and older and features the same format as the 2-Man Team Championship. The event is played over three rounds, with each round using a different format. The first round is played under the four-ball (bestball) format, the second round is foursomes (alternate shot), and the third round is a scramble, thereby yielding a 54-hole team score. Team members need not be from the same club. All competition will be played at scratch - no handicaps. To be eligible, team members must have a combined WSGA Handicap Index of 19.9 or less. This invitation-only 18-hole stroke play competition features Wisconsin's top amateurs, WPGA professionals and unaffiliated professionals. Amateur invitations are given to the top 50 players on the WSGA's Amateur Player of the Year points list, the top 15 players on the WSGA's Senior Amateur Player of the Year points list, all amateurs who made the cut at the previous year's State Open, and the club champion from the host club. Invitations to the event are sent out to all qualifying players in February. The WSGA, in conjunction with the WPGA, co-sponsors this all-star event in which the twelve highest ranked amateurs along with the four highest ranked senior amateurs compete against their professional counterparts in a team competition conducted under a match play format. The competition features individual (singles) matches and four-ball (bestball) match play. The Nelthorpe Cup Matches annually showcase the states best golfers and is by invitation only.